One competitor refused to drop his new stuffed animal while competing. A young competitor needs a helping hand after a dramatic fall. 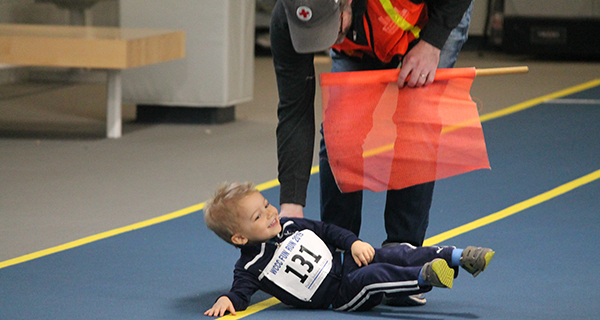 Wellesley College may never become a track and field powerhouse, but on Saturday morning, the track of The Keohane Sports Center was filled with young sprinters performing in front of a large, cheering crowd hanging on their every step. Well, hanging on their every step, trying to explain to them where they should be running, and picking them up when they started crying. The Wellesley Community Children’s Center held its 39th Fun Run and Fair on Saturday morning, featuring dollar stuffed animals, face painting, karate exhibitions, hockey, basketball and tables full of enriching activities. 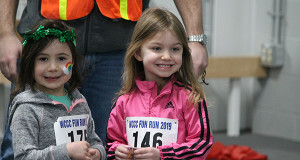 However, it was the children’s races that brought the most excitement and attention to the event, as competitors ranging from 2-12 competed in ten different age divisions for over two and a half hours. The competition was far from fierce in the 2-3 division, as many children struggled with the concept of where they were supposed to be running and why. Many kids stopped to wait for the other children, stopped running once they reached where their parents were standing on the side of the track, or fell while trying to run as fast as they could. Many finishers crawled over the finish line, which sounds far more dramatic than it was in reality. The 3-4 division saw a huge gap in competitive level, as some kids were decked out in track suits and sweatbands while others (including one deceptively quick girl dressed as Anna from “Frozen”) were not quite in race-appropriate attire. This dichotomy did lead to a girl in a rainbow skirt dominating a couple of boys in basketball jerseys, which felt like a metaphor for something, but it was tough to pin down exactly what. By the time the five-year old’s and over competed, the races became far more serious - although plenty of kids ran with their faces painted from the day’s other activities. WCCC board member Tim Mould explained that this was his 19th year at the event, and that the races always attract vast numbers of competitors. Face paint and track suits were a common sight among competitors. While there were no official winners, Mould explained that every competitor would be given a ribbon so that “everybody’s a winner.” With proceeds going to the WCCC’s Early Childhood and After School programs, the kids of Wellesley were the winners too - even if they couldn’t outrun the girl in the Anna dress.